One side of Hanyang University (HYU), Seoul Campus has been undergoing change since the end of last November. The construction at the Track and Field (T&F) will last for about 17 months, from November 20 in 2018 to March 31 in 2020. This construction has been carried out through the second basement level to the first level of the ground at T&F. It aims to improve the sports facility and pedestrian welfare of the existing T&F and to secure parking spaces on campus. On the first and second basement levels, both parking lots and 49 student club rooms will be built. 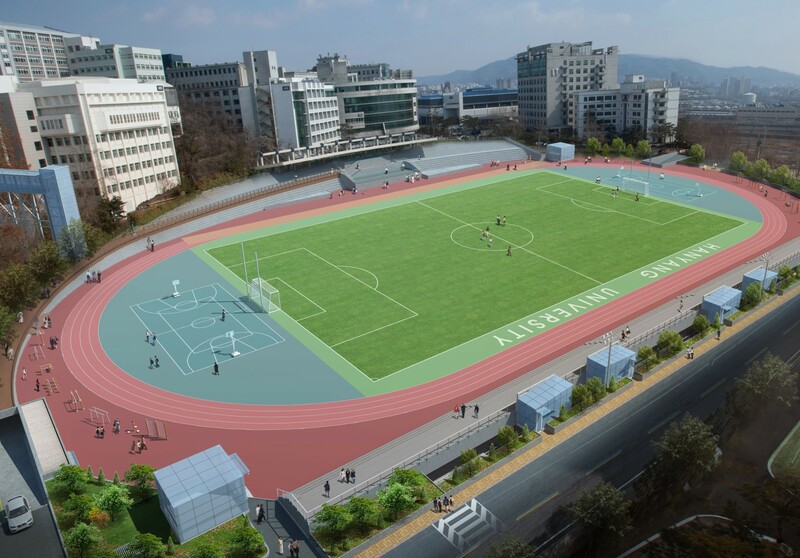 In addition, students sports environment will be enhanced by setting up a track, two basketball courts, a soccer turf, and a few exercising instruments. The remodeled T&F will ease the parking difficulties on campus, which have caused serious problems so far. Currently, HYU Seoul Campus provides 2,170 parking spaces including parking lots at HIT and the Business School. However, the shortage of parking spaces is getting worse as much as banning around 4,500 cars from parking in a day, due to the continuous increase in the number of visiting vehicles. Especially, since not only main roads but also fire lanes are parked at night, it is considered as an urgent issue. At that point, T&Fʼs newly built basement parking space will contribute to promoting a pleasant campus environment through the expansion of parking rooms. Meanwhile, shortcuts throughout the campus will be created after the construction. It is planned that two shortcuts linking the parking lot on the second basement level of T&F to the first floor of the Fusion Technology Center, and the T&F elevator on the first and second basement to the square in front of the Paiknam Music Hall will be constructed. HYUʼs Office of Facility Management, the management department of this construction, interviewed that currently, the progress of the construction is going on without any major problems. But it can inevitably lead to inconveniences such as noise, power failure, and lack of water supply, asking for understanding and cooperation to the HYU students. There is still a year left before the completion. Letʼs look forward to a brand-new Track and Field.